Overview: I love being a homeschooling mom! But as I look back, there is one thing which has often crept in and stolen my joy. Learn my biggest homeschool regret. We’ve been a homeschooling family for a long time. 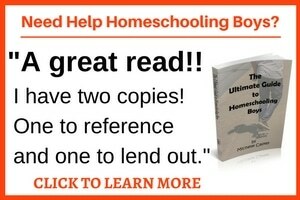 Before my oldest son turned 2 years old, my husband and I both felt called to check out this homeschooling lifestyle and see if there was any way we could make it work for our family. I have to say that we’ve absolutely fallen in love with it over the years. Being able to spend so much time with my boys and being able to watch them learn and mature has been an amazing blessing! As I look back, however, there is one thing which has often crept in and stolen some of the joy out of our experience. If I could go back and change one thing, it would be to worry less and to trust God more. There have been several specific times over the years which have caused me to worry. My older son caught onto reading very quickly, however, my younger son took longer to become a fluent reader. During the years that he was struggling to learn and I was struggling to teach him, we both suffered more than we had to. I was harder on him than I should have been and I’m sure that didn’t help. I pushed him when I should have stayed relaxed and trusted the process. And even though I tried to stay outwardly patient, I’m sure he picked up on the tension I was feeling. Kids always do. This son spent a lot more time reading Henry and Mudge, Mr. Putter and Tabby, and Amelia Bedelia out loud to me than did my older son. Rather than enjoying all of this extra time that we spent reading together, I kept entertaining that nagging feeling that I was doing something wrong. I wish I could go back and relive those days knowing what I know now – that this son would become a successful reader on his own timetable. Another thing which threw me for a loop and caused me to worry was seeing how differently my boys behaved than I had as a child. When I was a little girl, I loved to read. I could sit quietly in my bedroom with a book for hours. In fact, I usually had stacks of books that I was reading at the same time. I would read a chapter or two from one book and then switch to another. 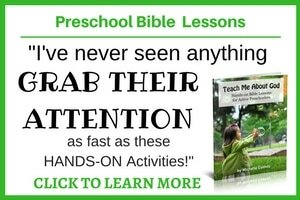 When my boys were Pre-K age, they enjoyed “schoolwork” as well because it was fun, it was hands-on, and it allowed them to move and jump and be very active. Once more written work came into play, however, they started to rebel. They didn’t enjoy sitting still for long periods of time. They didn’t look forward to doing their schoolwork anymore. Rather than stepping back and taking a look to try to figure out why their attitude had changed, I tried to push them harder. I was worried that they would fall behind or that they wouldn’t learn if they didn’t learn a certain way. If I could go back, I would have started researching boys and how they learn best a lot earlier than I did. I think I could have saved us all a lot of grief if I had known then what I know now. Boys and girls do not learn best in exactly the same way! Boys learn best when they are allowed to move. Boys love hands-on activities. My boys have always been big for their ages. They look a lot older than they really are. At age 15, one son was pushing 6’5″ and at 14, the other was 6’3″. Because of their height, my husband and I have often forgotten how young they really were and have pushed them to behave at a level of maturity that they weren’t capable of achieving. This often caused us to worry about their behavior. Then, when we would see other children who were the ages of our boys, we would look at each other in surprise realizing what good boys we actually had. I wish I could go back and stop being quite so hard on my boys. Our kids tend to rise or fall to the level of expectations that we have for them. So, it isn’t all bad to set high expectations. However, I wish I hadn’t set them quite as high as I did. I’m sure I caused them to feel frustrated, at times, trying to live up to what I wanted for them. And I experienced anxiety thinking that my boys had behavior issues when they were actually just being little boys. After all these years, I’m still in the process of learning this one. Once my boys have graduated from our homeschool, are living their lives for Christ, and have become gainfully employed, then I’ll be able to sit back and rest confidently in my curriculum decisions. In the meantime, there is still that little voice in the back of my head which gives me an inkling of doubt. 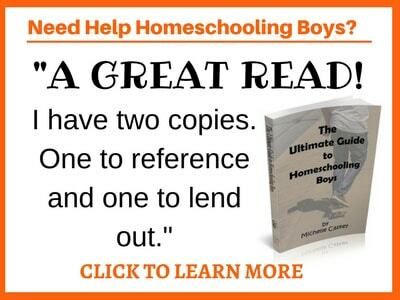 My husband and I are confident that God has called us to homeschool our boys. We have felt His leading through the years when we needed to make changes in how we were teaching them. We’ve had convictions about helping our boys get more educational experiences outside of the home. We’ve seen Him guide us toward competitive sports opportunities. And we’ve had times when we’ve known that He wanted us to pull back from something we had been involved with in order to regroup. God has a unique purpose for all of our kids. They all benefit from receiving an individualized education which is just right for them. I need to relax in the fact that if God has led us to homeschool, He will guide us through the adventure and will make sure that my boys come out on the other side equipt for whatever He has for them in this life. I may not be able to go back – but I can go forward with a renewed sense of peace. Like this advice? Please pin it for later! And be sure to check out the other great posts about Homeschool Regrets from other iHN bloggers at iHomeschool Network. Oh, I so resonate with each reason you’ve listed. 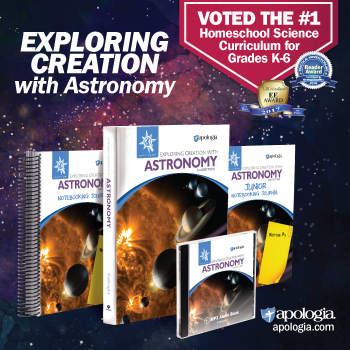 I’m just finishing our 7th year homeschooling. I think we all fear that we are not doing enough, so we try to push for more. Great article, thanks! You are welcome, Jessica. Hopefully, it helps to know that you are not alone. I think most of us (all of us?) struggle with this issue. Thanks for taking the time to comment! Great post! It’s all so true. I always feel like I’m not doing enough. I think it’s universal! I think you’re right. Moms put lots of pressure on themselves… and the fact that we homeschool only compounds that. Thanks for stopping by! Well I must trusted God more! Oh my goodness! Michelle, this post truly touches my heart! I love how your honesty-and have gone through such similar thoughts & feelings myself. 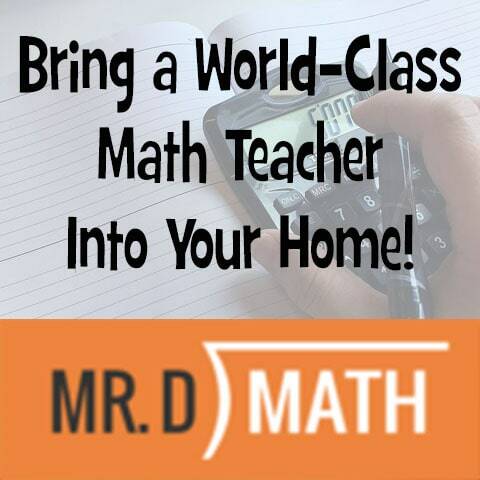 I am so appreciative to you for sharing this part of your homeschool. I know I will reread this several times over the next few years to help me as I home educate our sons. You are a gift to us all! What a great post! I have two little ones, I’m gong to try to remember your words as I go through my homeschooling journey! Thanks for sharing! Thank you for sharing. I have three beautiful and so full of energy boys they indeed are! It’s because we love them so that we moms want more. But yes we must exercise daily our surrender and trust that God will complete his work. You’ve been an inspiration – you’re amazing. Well said. I’ve been homeschooling since the beginning also, and my kids are now almost 17, 14, and 11. Goodness, I’ve learned a lot, and I wish I could take back being too tense and hard on my kids at times, too. There always seems to be new phases and new challenges along the way, but I’m so glad I’ve persevered. Can’t believe my oldest will be a senior this fall!! Thanks, Brandi. It’s always good to know that we aren’t the only ones with a certain struggle, isn’t it? I appreciate your comment. And you should be so PROUD of your accomplishment. It won’t be long and I’ll be graduating my oldest son as well. Yikes! Time sure does fly, doesn’t it?!? I hope this coming year will be a huge blessing for you and your kiddos and that you’ll all enjoy it immensely. Thank you for this post Michelle! This is my first visit to your blog and I loved this piece – especially the parts about worry and about having too high of an expectation. I have 4 sons and 1 daughter and I probably really need to relax a little. 🙂 My oldest is starting high school next year and I realized that I have definitive ideas on what I think an “excellent” education means to me. I have high goals for my children but I need to remember that they may reach those goals in many different ways. Thanks for reminding me to savor the time we are given! Hey, Jennifer, I’m so glad you found me! And I’m glad you liked this post. Yes, I think we all need the reminder to cherish the time… I hope you look around a bit on the site. With four boys, there are plenty of other posts that you might enjoy as well. And I’m sure I could learn a thing or two from you! If you’re ever looking for anything in particular, let me know and I’d be happy to direct you. Thanks again for stopping by and for taking the time to comment. I really resonate with what you say. I’m a primary school teacher in the UK (5/6year olds) and a mum of two very different boys (3 and 7 years old) and your message is beautiful. I really struggle with keeping a lid on my expectations and those of others to remember that my boys and pupils are unique. There are so many posts out there to read but I love yours, thank you! I wish more people would realise how important individuality is. Oh, thank-you so much for your kind words, Gemma. I really appreciate them! And you’re so right. I guess the best thing we can do is to give that gift to our own children… and you can give it to all of the various students that you teach as well. Thanks so much for stopping by! Love everything about this post, Michelle! If there’s one of these I struggle with, it’s feeling like I have to prove homeschooling works. I have so few homeschoolers in my day-to-day life and most of the folks around us are fairly critical of our choice to homeschool. I needed that reminder to not stress over what everyone else thinks! I found that the High Expectations paragraph was me spot on. My three older children all got their growth early (yes, my boys are well over 6′ now too). I expected a lot of them without even realizing it until they were with other kids their ages who acted a lot younger. God put us in a situation after the 2011 Joplin Tornado where my kids had to grow up fast and help those in need. So, ultimately, though it cheated them of part of their childhood, they enjoyed it, and it was good for them. I’ve always said I’m raising adults not children. Be blessed, and don’t be too hard on yourself. God knows what your boys will do in their life, and he chose you to mother them. I can so relate to some of your regrets. My kids are tall too…for most of their lives they have been 1-2 sizes ahead in clothes and I felt I was always having to tell people that they were younger than they looked. And your reading situation I can relate to also. I have three boys. My oldest was memorizing books at three and reading by four, with nearly no pushing from us. My 2nds was reading right before or soon after starting kindergarten. Still, I thought he was behind…and the first teacher conference was expecting the teacher to express concerns about how he was doing, and in stead she told me that he was about a grade ahead in reading and math! Then there was my third…I admit I didn’t work as much with him on letters and numbers and such, and he went to sleep so easily compared to my others he read bedtime stories much less (he preferred songs). And my mom’s health was failing, so I was distracted by that as well. A year before Kindergarten he hadn’t even learned his ABCs. But I thought…everyone else was ahead, maybe he’s not THAT behind. I tried to work with him to catch up…I pushed him and he pushed back and I backed off afraid I’d make him afraid of school. When he started KG he was excited to go, but that first week he showed signs of trouble…and at the end of that week my mom passed away. He started crying every day before school and saying he didn’t want to go, I thought it was about my mom…but it continued ALL YEAR. And all year we had conferences about how behind he was. He loved his teacher, but he hated school. He didn’t even seem to do as well there as at home (at home he was trying out writing letters…at school he scribbled). “crying time” gradually decreased but it hasn’t been since late last year, with the Piggie and Elephant books, that he has WANTED to read…that’s he’s actually asked to do reading first in our homeschool in stead of trying to get out of it, and that he laughs and giggles while we read and though we take parts (he likes to do Elephant and have me do Piggie) he’ll sometimes forget and do Piggie’s part too (and I’ll pretend not to notice, cause WOO HOO he’s reading more!) . But that 20 minutes of crying before he would try? That’s what being pushed to do something he wasn’t ready for for a year did. And it took two years to get to the point where he actually enjoys reading anything. And yet I question myself all the time…am I spending enough time? Is he reading enough? Am I doing enough? It’s HARD when your child is behind where everyone thinks they should be. It’s hard not to feel judged by your child’s performance when you’re homeschooling that child…and it’s a struggle not to let that self-doubt make me push my child in a way that might push him right back to hating reading again. Hey, thanks for the comment. I don’t mind long ones! I’m grateful that you shared your experience with your son because I think it’ll be beneficial to others. Yes, it is hard not to feel judged. Thing is, you probably are being judged by some – but who cares?!? Try to remember that you’re doing right by your child because you can see the fruit of your labors. And you can also see how much more favorably he responds when you aren’t pushing him to do things before he’s ready. Keep on keeping on. It sounds like you’re doing a wonderful job! Wow…that comment didn’t look THAT long in the little comment box. Sorry, I can be a bit verbose. JUST what I needed today. We are in our 4th year. My boys are 9 and 7 and a 5 year old girl. My oldest is a super reluctant reader and writer…or maybe I’m just not teaching him the way he needs to be taught. Thank you for this post. So encouraging. Thank you so much for your sharing! I read that with a laugh of complete agreement, a tear of sorrow that I still struggle with this sometimes (11 years under our belts), and relief to know I’m not alone. Just yesterday I was wrestling with not comparing my 15 yr oldest son with myself as a high schooler. I will regroup, breathe deep and trust the Lord afresh. You’re so welcome, Jennifer. You are certainly not alone! Michelle, this was an absolutely brilliant article! Between you and Todd Wilson, I am continuously reminded to take a chill pill, because God’s got this! Thanks and God bless! Thanks for this post! Reading it felt as if I was talking over coffee with a friend. My boys are 14,12, & 10. And tonight I needed this. Thank you so much for this post. I seriously needed to read this! I have only been homeschooling a little over a year now and I have 2 boys. God has led us to homeschool too. However sometimes I have felt that what if I am not enough, what if they don’t learn what they need to in order to be where everyone else’s kids are… My eldest pushes back a lot when we do school, but like yours they both love to be active and doing more than just sitting down. When we first started the year I pushed them to see what we could get down, but life overwhelmed us and then I felt the Lord lead us to a more minimalist approach. I pray that I will be able to trust Him more with the schooling aspect and not worry so much. So when I came across your words, they really hit a nerve. Sometimes He uses others lives to help and sometimes its through our own life and experiences that help others. So thank you again for sharing!! Thank you so much for sharing this! It resonated so deeply in my spirit, as if I wrote it myself! Your words encompassed everything I have felt or done as a homeschooling mama. My sons are both in HS, one is a senior this coming year and the other a freshman, and I have pondered quite too often lately on my regrets. Oh, the years worry did steal…when I should have trusted so much more, breathed, and just enjoyed instead of comparing, criticizing, proving, etc. (Both of my son’s were big for their age too.) So grateful that God’s mercies are new EVERY DAY and it is never too late. Thank you again for your candid and honest post. You sure did touch this mama’s heart! I came across this right when I needed it! Thank you so much for sharing it! We started homeschooling my son last year, he is now in his first year of high school. There are so many things he hasn’t learned in public school that I feel he should know, there are many times I think I push too hard, put too much on him, and stress both of us out. I didn’t look at it this way until I read your post, so again, thank you! !